Thanks to FLMSP support, the Ohio Capital Budget recently signed by Gov. Kasich includes $200,000 for repaving the worst sections of the Little Miami trail in Warren County. These funds and projects will be directed by the Ohio Dept. of Natural Resources in the coming fiscal year. The Friends of the Little Miami State Park have already done what we can to reduce tree roots, grind down bumps and fill cracks and potholes. 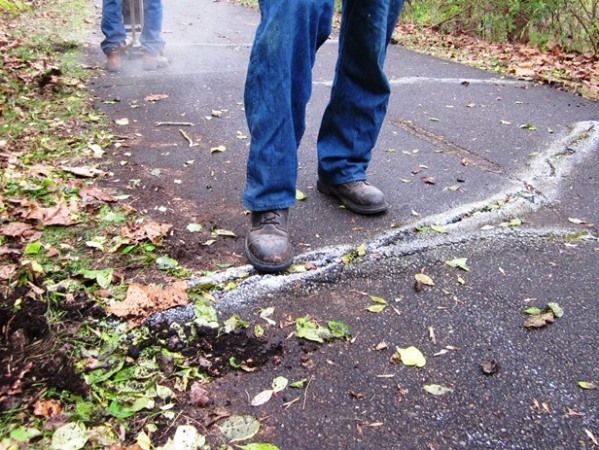 Much of the trail needs to be resurfaced, an expensive project requiring funding from the state. The owner of the trail, the Ohio Department of Natural Resources, has developed a multi-year plan to repair the ditches, culverts, bridges and riverbanks and then resurface the 50 miles of the trail. But resurfacing is a lower priority and may not begin for years. The Friends of the Little Miami State Park would like to see repaving of the oldest (1983) and most deteriorated sections done sooner. To address this repaving priority, in January FLMSP asked its many supporters, as well as several local governments and organizations, to contact Ohio legislators in support for a community-based capital funding request. Many of you did this--THANK YOU! Your efforts and those of our local representatives have resulted in a recommended $200,000 in the state budget now being debated. Friends of the Little Miami State Park give hearty thanks to Representative Tom Brinkman, who met with and guided our Board of Directors, and Senator Steve Wilson for presenting our request to the Ohio Senate. As Senate Bill 266 makes its way through the legislative process, you track its progress here.